Kensington Palace has released the dates of the Duke and Duchess of Cambridge's upcoming royal tour of India and Bhutan. The week long tour will run from 10th to 16th April 2016. The tour will begin in India, where the royal couple will see a variety of aspects of contemporary Indian life, focusing on young people, sport, entrepreneurship, Indian efforts to relieve urban poverty, the creative arts, and rural life. William and Kate will begin their visit in the creative and business hub of Mumbai. They will then travel to the capital New Delhi, which is the seat of history and politics in the world's largest democracy. In Kaziranga National Park, The Duke and Duchess will experience the rich variety of wildlife and also pay tribute to the rural traditions of the communities who live around the park. In Bhutan, The Duke and Duchess of Cambridge will meet Their Majesties The King and Queen of Bhutan. They will also have the opportunity to learn more about the heritage and culture of this beautiful mountain kingdom and its people. The Duke and Duchess will conclude their tour back in India at the UNESCO World Heritage site the Taj Mahal, allowing them the chance to thank the people of India for their hospitality by visiting their most iconic landmark. Today, Catherine made her first solo trip to Scotland since becoming a royal. Four months after she visited Dundee with Prince William, Kate was back in the country to visit three school-based charity projects in Edinburgh linked to causes close to her heart. Kate, who goes by the title, the Countess of Strathearn in Scotland made her first stop of the day at St. Catherine's Primary School. During her visit to the school, Kate met with teachers and students to see how Place2Be's work in Scotland is improving the emotional well-being of pupils, parents, families and school staff. Kate arrived dressed in a recycled forest green Sportmax coat she had previously worn on Christmas Day while attending church in Sandringham. The Duchess teamed the long belted coat with a fitting houndstooth skirt by Scottish label, Le Kilt. This is the first occassion Kate has championed this brand which was founded in 2014 by Samantha McCoach. McCoach had a vision of adding modernity to her family's kilt-making heritage which extends over 40 years. This timeless Le Kilt skirt is hand crafted in Scotland, from 100% British wool. The classic pleated A-line skirt features a flat fronted apron fastened with black leather side buckles. It is finished with a traditional Kilt pin. Kate paired the skirt with a black turtleneck sweater. We have seen the top on a number of occasions and its defining feature is a fine contrast trim along the roll neck and cuff. The top remains unidentified, but I think it may be the Christopher Kane roll knit lurex trim sweater, or a bespoke version or it. Kate has worn a few Christopher Kane garments in the past, so there's a good chance I'm on the right track with the designer! I've contacted Christopher Kane and waiting to hear back. Kate accessorized the outfit with her favorite black suede combination of the Mulberry 'Bayswater' clutch and Stuart Weitzman 'Power' Pumps. She finished the look with her KIKI 'Lauren' Yellow Gold Diamond Pave Leaf Earrings and Cartier Ballon Bleu Watch. Kate's second engagement of the day saw her visit the Wester Hailes Education Centre, which houses The Art Room's first studio in Scotland. Kate's final stop of the day was at Craigmount High School, where she took part in a tennis coaching session with Judy Murray, mum of British tennis player Andy Murray. It's no secret that the Duchess of Cambridge is a huge fan of tennis and has been a public supporter of Andy Murray during the Wimbledon tournament. Judy Murray's Tennis on the Road coaching clinics aim to deliver starter tennis lessons to both adults and children, encouraging them to get active and play the sport. As anticipated, Kate made a quick wardrobe change for this afternoon's sporting activity. She was dressed casually in a white Nike baseline 3/4 sleeve tennis top and Monreal London Side Panel Track Pants. On her feet were the ASICS GEL-Solution Speed 3 tennis shoes. On Sunday, The Daily Mail posted a candid photo of the Duchess of Cambridge out shopping in Chelsea this past week. She was spotted leaving the activewear store, Lululemon and carrying one of their trademark re-useable bags. For the shopping trip, Kate was dressed casually in a mix of active wear and high-end fashion. She wore a Temperley London leather and suede gilet (£1,250). The shearling and leather trim vest is a past season piece originally retailing for £1,250. The gilet shares elements with the Temperley London 'Odele' sheepskin coat, which Kate has worn on many off-duty occasions. Under the gilet she wore her Temperley London black wool honeycomb tunic. Other familiar pieces included her Tod’s Bauletto handbag and Annoushka/KIKI pearl drop earrings. Some of you may recognize the leggings and sneakers from this candid photo taken of Kate in 2014 during her walk through Kensington Gardens with Prince George. The pink and white sneakers were identified as the ASICS GEL – Oberon 8 trainers (sold out) and according to @MiddletonMaven the leggings are from GAP. The Duke and Duchess of Cambridge returned to Anglesey today to bid farewell to Search and Rescue (SAR) operations at RAF Valley. William and Kate lived in Anglesey for three years when Prince William served as an operational SAR pilot flying the now-retired Sea King helicopter. The royal couple visited the base in North Wales to attend the SAR Force Disbandment Parade, which marked the end of more than 75 years of RAF SAR UK operations. Following the ceremony, William and Kate attended the reception for current and former squadron members. Duchess Kate looked lovely today wearing her long, fitted burgundy red LK Bennett 'Ami' coat. The coat has been a favorite of Kate's since she debuted it in November 2011. This is now the fourth occasion Kate has donned the coat. While I can't say for certain, Kate could be wearing the Whistles burgundy 'Sofie-Rae' dress under the coat. This is a pairing she debuted in 2011 during a visit to Denmark. We also saw the return of some of her favorite accessories, including the Lock & Co Betty Boop pillbox hat and Mappin & Webb Empress earrings. While I cannot say for certain due to lack of hi-res photos, I believe Kate wore her chocolate brown Cornelia James 'Imogen' pure wool gloves and carried the Emmy 'Natasha' suede clutch in the same shade. Kate wore a "new" pair of brown suede pumps today. They have a mid-heel height with a classic pointed toe. This generic style has been difficult to identify from limited photos. Today, the Duchess of Cambridge took on a new role as guest editor of the news website, Huffington Post UK. She helped launch their "Young Minds Matters" initiative which aims to raise awareness of children's mental health issues. As guest editor, the Duchess wrote an eloquent piece outlining why she chose to support children’s mental health. You can read the full script at Huffington Post. In addition to writing her own blog, the Duchess commissioned contributions from a number of leading figures in the mental health sector as well as from young people, parents, and teachers. A makeshift “newsroom” was set-up in Apartment 8 of Kensington Palace, the childhood home of Princes William and Prince Harry. Kate looked ultra chic and professional today, dressed in a new ensemble. She wore the Reiss 'Vinnie' blouse (US$230) featuring a textured stripe design and a high neck. Kate paired the shirt with the Dolce & Gabbana's bouclé wool-blend skirt. The tweed skirt offers a modern twist to a classic and features contrast button fastenings and a yarn fringe detail peeking out from the side. It originally retialed for US$895 but has been reduced to US$537 at MyTheresa. Kate choose to accessorize with her Annoushka pearl/Kiki hoop earrings. On her wrist was the Cartier Ballon Bleu stainless steel bracelet watch. 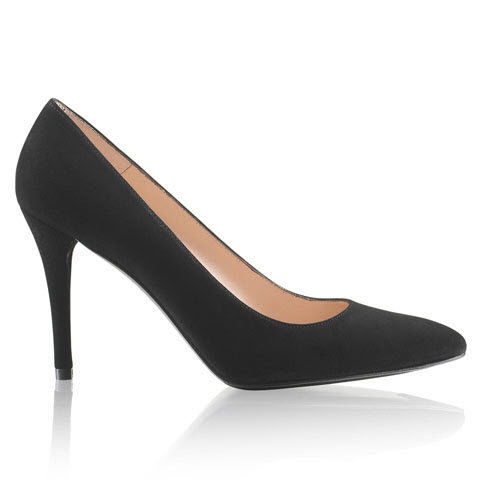 On Kate's feet were her beloved Stuart Weitzman 'Power' black suede pumps. In related news, Kensington Palace just announced that the Duchess of Cambridge has added the Anna Freud Centre to her growing list of patronages. The Anna Freud Centre is a children's mental health charity which Kate first visited in September last year and also attend their Christmas party in mid December. It reflects Kate's continued personal interest in children's mental health and emotional wellbeing.